If you're interested in specatator sports, football is Rome's unmissable attraction. However, Six Nations rugby matches are beginning to attract visitors and make that sport more widely known in the city. Both SS Lazio and AS Roma have won Italy's football championship in recent years. Interrupting years of dominance by rich northern clubs, the two teams continue, despite hardships and financial setbacks, to battle at the top of the Serie A rankings. Don't believe people who repeat generalisations about the two teams' fanbases: whatever you may have heard, both teams have huge local support from all sectors of the population, and both sets of fans enjoy slandering the other. For more about seeing a football match in Rome read Football in Rome. 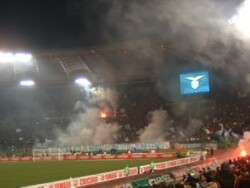 Both Roma and Lazio play their home matches at the Stadio Olimpico, to the north of the city centre. The football season lasts from September to May, and matches take place on Sunday afternoons (or sometimes Saturday or Sunday evenings for the bigger games). European and Italian Cup matches take place midweek. The profile of rugby in Italy is slowly rising as the national team improves. Six Nations matches bring hordes of happy overseas fans to Rome to follow their team. Read more on our rugby page.